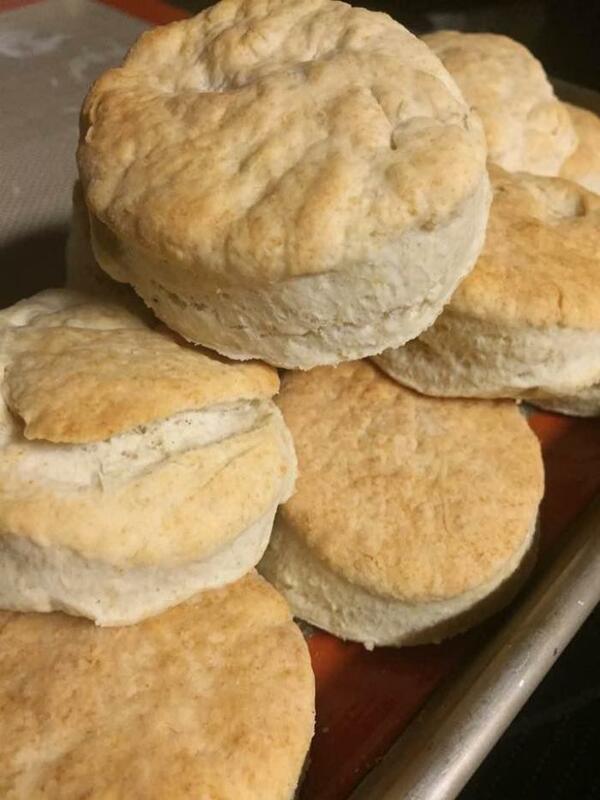 These airy biscuits are fluffy and soft. They will stay that way all day! 2In a large bowl combine flour, sugar, baking powder , cream of tartar and salt together. Cut butter into mixture until it begins to look like cornmeal. I use a food processor but you don't have to. 4Make a well with flour mixture and slowly add milk into the middle. Knead dough with your fingers and add milk when necessary. Again, you can use the food processor. Put it on high and go until the wheels fall off (until the dough releases from the sides)! Roll out dough onto a lightly floured surface and roll out to desired thickness. Cut with small biscuit cutter. 6Butter bottom of skillet and place biscuits in pan. Bake for about 8 minutes until biscuits have risen. Turn on broiler to brown tops. Watch closely as this will only take a few minutes longer. minutes or until golden brown. The milk you use doesn't matter. Personal preference here. You can use buttermilk if you like. Also, The thicker your dough, the less biscuits you will have. I do about 1/2".